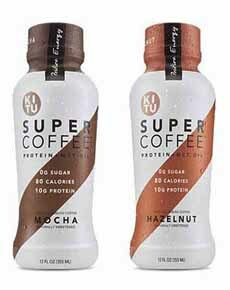 Kitu Super Coffee is a delicious blend of real ingredients for all day energy. It’s sugar free, lactose free, soy free, and gluten free, with 10 grams of protein. Jordan DeCicco, founder of Kitu, created Super Coffee in his dorm room. As a tired college basketball player seeking refreshment, he found only sugary bottled coffees and energy drinks at his school. Not wanting the empty sugar calories, he brewed a better-for-you energy blend following the ketogenic diet nutritional approach known. He incorporated healthy fats and protein for fuel, rather than carbs and sugar. 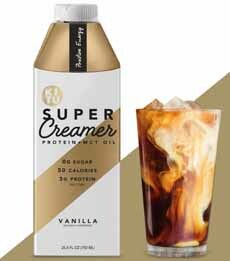 Now a successful brand with national distribution, Super Coffee can be stored at room temperature, but is best enjoyed refrigerated, over ice, or heated up for two minutes in the microwave. The line is gluten free, GMO free, lactose free, and soy free. While it was designed as a functional food (one with benefits beyond its normal purpose), it is equally attractive to people who drink sweetened bottled coffee but would like it without sugar or dairy. Kitu also makes similarly-enhanced creamers for coffee and tea in Original and Vanilla. Two of the four flavors of Super Coffee, made to truly energize and enrich your coffee experience. Super Coffee creamers for your home-brewed coffee or tea. Both photos courtesy Kitu Life. *MCTs (medium chain triglycerides are an energy source that is metabolized very quickly, providing a fast-acting, sustained energy boost without the crash. They have been shown to stabilize blood-sugar levels, suppress appetite, lower cholesterol, improve brain function and increase nutrient absorption. †Phosphorus forms strong bones, and you need potassium aids in proper nerve and muscle function. ‡Whey protein (milk protein) adds creaminess along with a boost of amino acids. It is known to help maintain lean muscle and suppress appetite. Whey protein concentrate is lactose free, but not vegan.